This Halloween, you’re invited to FUNtastic Dental’s “Not-So-Scary” Halloween Party 2015! Please bring friends & neighbors and join us for a great costume party at your favorite Long Beach dentist’s office. This event will take place on Saturday, October 24th, 2015 from 12:00 PM-2:00 PM. Don’t forget your costume! 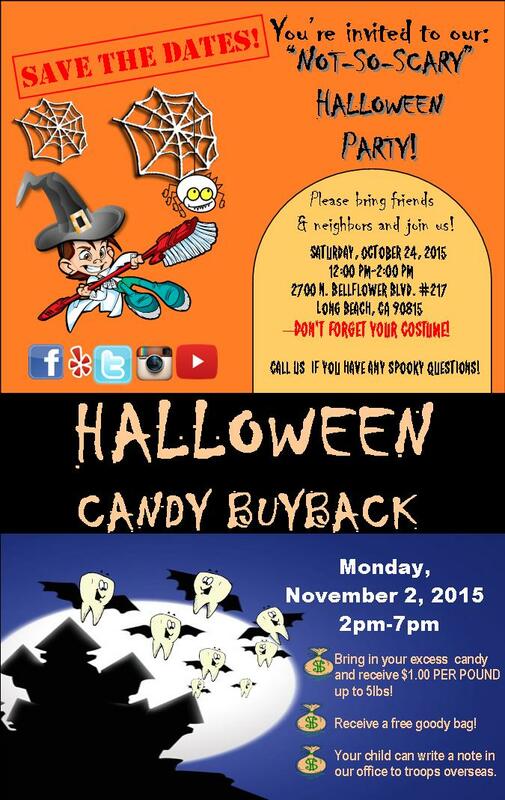 Following the spooky fun, on Monday November 2nd, 2015 from 2:00 PM- 7:00 PM, FUNtastic Dental will be hosting a Halloween Candy Buyback event. Bring us your excess candy and you’ll receive $1.00 PER POUND up to 5lbs! You’ll receive a free goody bag just for stopping by. And your child can write a note in our office to troops overseas. Hope to see you soon! Call us today if you have any spooky questions!